Have you ever wanted to get loud in the library? Do you wish there was a family-friendly and fun way to ring in the New Year right here in Beaverton? Then we’ve got an event for you. 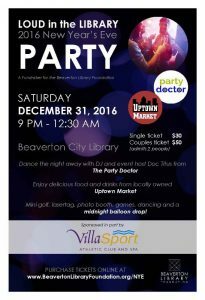 Presenting sponsor Villa Sport invites you to get Loud in the Library and ring in the New Year at Beaverton City Library! On Saturday, December 31, from 9 p.m. to 12:30 a.m., gather your friends for a night of New Year’s festivities at the main library (12375 SW 5th St). Entertainment includes mini golf, laser tag, and a photo booth. Come dance the night away with DJ and event host Doc Titus from The Party Doctor and enjoy delicious food and drinks from locally owned Uptown Market. While the party is intended for adults, all ages are welcome. The entire building will be transformed into a place for noisy celebration. Can’t imagine a bartender and drinks in the Cathy Stanton Conference Room, a DJ and dancing in the meeting rooms, mini golf in the Children’s area, laser tag in the Reference area, and a giant balloon drop in the beautiful, iconic stairwell? Buy your tickets today—you won’t want to miss this opportunity to get Loud in the Library! Plus, there is plenty of parking. Tickets are available online and from Beaverton Library Foundation board members and library administrative staff. A single ticket is $30; a couples ticket (admits two people) is $50. This highly engaging and unprecedented New Year’s Eve event is sure to be a blast for Beaverton community members who know and love the library and those who’ve never entered its doors before. All proceeds will directly benefit the Beaverton City Library through the work of the Beaverton Library Foundation. Since 1986, the Beaverton Library Foundation has promoted and funded reading and cultural appreciation through the sponsorship of library services and programs. Each year, they are the primary sponsor of the hugely popular and meaningful Summer Reading Program. More than 2,700 people visit Beaverton City Library and check out almost 10,000 items every day, and the Beaverton Library Foundation helps provide a margin of excellence that make Beaverton City Library the busiest single library in the state. Loud in the Library is a fundraiser for the Beaverton Library Foundation; volunteers are needed; tickets are required. To learn more and to purchase tickets, visit www.BeavertonLibraryFoundation.org/NYE or call 503-526-3705.